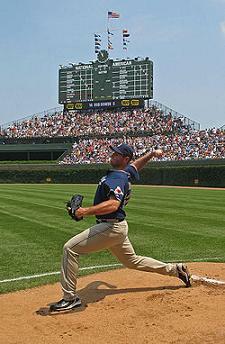 Torn rotator cuff problems account for the vast majority of shoulder-related complaints in this day and age. According to the American Association of Orthopedic Surgeons, between 1998 and 2004 over 5 million patient visits were made to physicians for a rotator cuff problem. 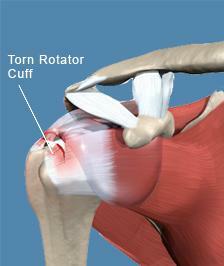 The picture below offers a simplistic view of what a tear may look like, and its location in relationship to the other structures of the shoulder. Remember in the shoulder anatomy section that the rotator cuff is made up of from the convergence of the four muscles in the shoulder that serve to stabilize and provide funtion to the shoulder: the supraspanitous, infraspinatous, subscapularis and the teres minor. A tear can come in a variety of sizes, shapes and severity; from the partial thickness to the complete, full-thickness tear. The incidence of torn rotator cuff conditions increases with age. This is primarily due to ongoing degeneration of the tendon tissue. So, given the fact that the Baby Boomer population in this country is aging rapidly, and is a huge population segment, there are going to be a lot of rotator cuff problems to address. 5-40% of the population without shoulder pain may have a rotator cuff tear. Of these people, 40% of these tears will worsen over a five year period and become symptomatic. Partial tears are 2X more common that full-thickness tears. The longer a rotator cuff is torn (assuming we’re talking complete tear here), the more difficult it is to repair, and are sometimes impossible to repair. This is mainly because an untreated full thickness rotator cuff tear can and will "retract" away from its insertion point, and the associated muscles will "atrophy" (waste away) over time. When this happens, it becomes extremely difficult to pull the cuff tendon back to its insertion point to anchor it down. If the surgeon is indeed able to mobilize it enough to re-attach it, there is still a risk of it being under too much tension and the failure risk increases dramatically. That is why it is extremely important to not let a shoulder injury, or shoulder pain, go untreated! So, who can get a torn rotator cuff? People over 40 years of age. Athletes, especially in throwing sports, swimmers, tennis and golf. Workers that engage in persistent overhead activities such as seen in the construction trades.